Purdue University researchers have devised a method of 3-D printing that can produce energetic materials with fine geometric features faster and with less expense than traditional methods, while also being safer and more environmentally friendly. Jeffrey Rhoads, a professor in Purdue's School of Mechanical Engineering, and Emre Gunduz, a former research assistant professor at the school, along with a few colleagues, have launched a faculty-owned startup called Next Offset Solutions Inc. that makes the printers and the energetic materials, including solid rocket fuels, other propellants and pyrotechnics. The energetic materials are produced through a method that allows the printer to produce viscous materials with a consistency similar to clay. "It's like the Play-Doh press of the 21st century," Rhoads said. The process allows the researchers to safely deposit energetic materials with a high level of precision. "We have shown that we can print these energetic materials without voids, which is key," Rhoads said. "Voids are bad in energetic materials because they typically lead to inconsistent, sometimes catastrophic, burns." The printer functions in a manner similar to typical 3-D printers except it applies high-amplitude ultrasonic vibrations to the nozzle, reducing friction on the nozzle walls and thus allowing the highly viscous materials to be pushed through. The method also allows for precise flow control. Researchers at Purdue also have used the method to print biomedical implants, personalized drugs and other products. Next Offset Solutions is primarily focused on the production of energetic materials, but is exploring other avenues for the technology as well. Rhoads said the printer is better than traditional methods of producing energetics because it doesn't rely on solvents to lower viscosity, which means faster production, lower costs and a more environmentally friendly process. "Some of these processes literally use a ton of solvents that we don't need," Rhoads said. The process is also safer because the printer can be operated remotely. "You don't have to have a person there interfacing with the system. That's a big advantage from the safety standpoint," Rhoads said. It also brings a novel solution to an industry that is often slow to change, because it takes a lot of time and money to get materials qualified by the departments of Defense and Energy. Next Offset Solutions uses already qualified material and instead changes the process. Rhoads is chief operating officer at Next Offset Solutions and Gunduz, who is now a professor at the Naval Postgraduate School in Monterey, California, is the chief technology officer. The company also has brought in a senior executive from a Fortune 100 company to serve as president. 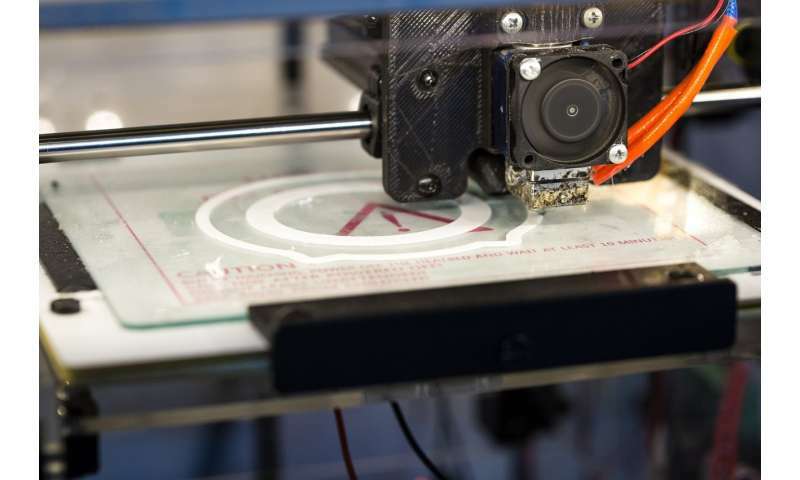 Next Offset Solutions is interested in providing the printers and the products they make to the departments of Defense and Energy and their contractors. The novel 3-D printing process was patented with the help of the Purdue Office of Technology Commercialization. The company also is working on other advanced research, development, testing, and evaluation in the additive manufacturing and energetic materials space.